Pixar is considered one of the best animation studios in the world. I THINK THAT'S AN UNDERSTATEMENT! Pixar rocks! I have all of the Pixar films in my DVD shelf, and I loved each and every single one. Even their weakest makes it in a top 5 list of it's own kind, well, maybe except Cars 2, but even that rocked! But, what is the best of the best? Well, since you can't decide on your own I guess I have to decide for you. These are my personal favorite picks from my favorite studio. In theory, this can be done horribly, yet, Pixar made it so you think it's a real world! I know people usually forget about this one, but I love it, all because of Sully and Boo. The two fit so well, it's like a real father and daughter. I almost cry ever time I see the ending. It always reminds me of myself and my baby cousin, Yun Bin. I also like it how it's a classic monster story with the roles switched around. Most people go with films like the Toy Story films or Rattatouie, (How do you spell that?) for this spot, but for me, this is the film that deserves to start off the list. And, I am going to see hte prequel and I'm going to love it. But, there's always one thing that I always ask. Is that a spider? Is that a rock? Is that a potato? Eh, must be the attack of the sprockatato. Hey! I got an idea for Monsters inc 3! Ok, this isn't a perfect film. I think sometimes the pace is too slow, but, hey, I still never got bored of it. It's a story about a father and son reuniting when seperated from each other. They treat the ocean like an udnerwater city inhabited by fish and I think it's really creative. 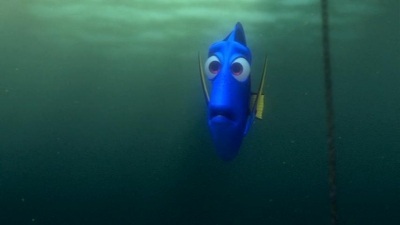 I like Dory, I like Nemo, I like Merlin, I like the sharks that always say Fish are friends, not food. Yea, I eat fish but, still, I had a goldfish friend named Marriland. Yea, the good old days... MARRILAND! WHY DID YOU LEAVE ME!? Either that or Mom felt like sushi that time I was at school. Anyways, Finding Nemo is like a cloth. Sometimes it gets damp but it's still something you can use over and over and over and over and over AND OVER AND OVER AND, I'm getting dizzy. Where do I begin with this? Everything is well thought out. Everything in this film could happen in the future. 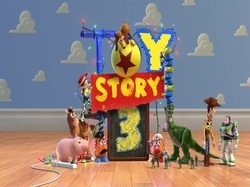 This is problably Pixar's best animation so far. Wall-E, in my opinion, is the most memorable character in the Pixar industry. Usually, I get bored when most of the film is silent, but in this case, it got me more interested, because you can read Wall-E's animated personality and exagerated actions better than diolouge. This is also considered by many to be one of the best sci-fi films of all time and one of the best animated films of all time. What else can you say, but nothing. Ok, I all ready talked and praised this film in my top 5 animated films of 2010 (Who do you think won... seriously, guess! Who?). So, becuase I'm lasy, I won't talk about this film much again, all I can say is that this is a classic, and one of my all time favorites. Go see it, it's definantly fun, and considering that's a film about toys, goal accomplished. But, what is the weakest of Pixar? See Here! So... good day and good night.